Last winter was our first on the farm, and the blog posts concerned the experience of starting with little: creating a greenhouse, mucking out a barn for transformation to a wash/pack space, and acquiring small tools and equipment to begin managing the land we will have in cultivation. The winter was cold, and snow accumulation didn’t really occur until late winter and early spring. Now our understanding of this place is hugely improved, and I’ll give a sense of what early season preparation looks like! With only the winter to work with last year, we built a 50-foot long, far-too-flimsy greenhouse against the big barn/machine shed. Last fall, we rebuilt using lumber and are excited for the change, except that yesterday there was an avalanche (small-scale, admittedly). We are fortunate that the greenhouse plastic had not yet been put up, but this does all mean that our limited number of seedlings are in the house, receiving inadequate sunlight. This is a primary challenge for growers: maintaining a warm and safe environment for newly sprouted seedlings in early spring, ideally with a dependable water source (still working on it). Finally accepting the bad idea that is our lean-to greenhouse, we realize we must build a freestanding structure in order to get through this season in coming years. It is possible to contract with other growers and have them grow our seedlings, but we tend to do things ourselves (to a fault? ), and we also value being able to tell the story from seed to plant or produce, all occurring on our farm. Seed starting can be done a number of ways, and our production is small enough that we are able to use a modified refrigerator to create an ideal seed germinating environment. An open container of water provides just enough humidity to the space, and heat is supplied by a string of holiday lights. A temperature controller turns the lights on and off to maintain a temperature of 72 to 75 degrees, depending on what is in the chamber. The fridge is used because it was free and is well insulated! Germination can also be carried out in a greenhouse, or any humid and warm space, though humidity and heat are more constant in a setup like ours, and germination is excellent as a result. For now, at quite a small scale, this works well for us. Both years we have occupied this farm, winter weather has defied our intentions for February and early March. 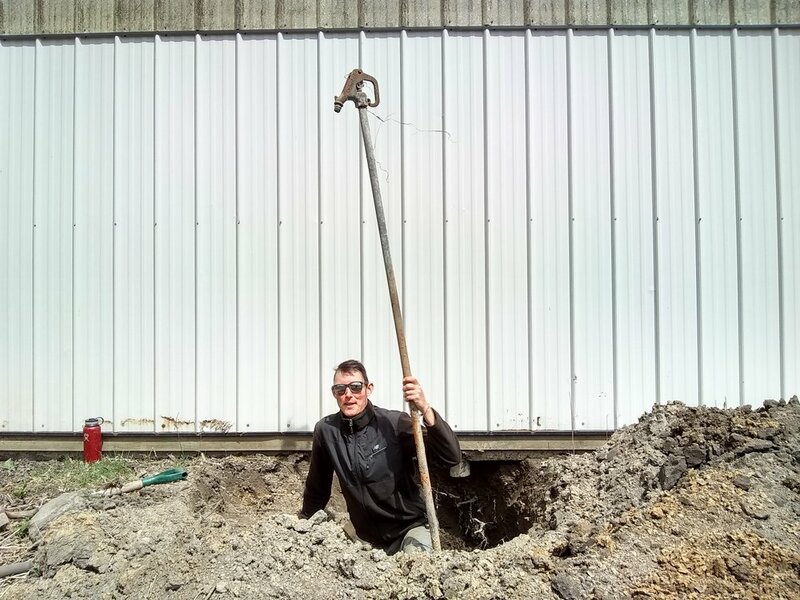 Late winter is not a very glamorous time to be a farmer: it often means infrastructure upgrades, repairs, building projects, and the like, sometimes in the rain and cold. The cold of this February prevented us from doing almost any productive farm labor. Products like PVC cement and protective outdoor paint do not function properly at 10 degrees, and the depth of snow made it unsafe to do things like cut down select trees (for farm management and firewood). It isn’t actually spring yet, but the cold weather broke in a dramatic way and certain tasks cannot be avoided. Since the greenhouse is distinctly inaccessible, we are able to focus some time on diverting water from its original path straight to the basement. That’s a little dramatic, to be honest. Yes, there is water in the basement, and yes, that is running water underneath Nicholas; but it is in fact fairly easy to manage, especially since we are no longer fresh from the city! That’s the early season scoop from here. We remain very excited to get growing and are enjoying the stark winter scenery (turning goopy and gray as I write). And STILL watching the dairy barn’s shockingly slow demise. Lo, it's the first Hexagon blog post of 2019! This February is proving to be remarkably similar to last February, which made the prospect of setting up our first year infrastructure pretty challenging, but with more snow. Fortunately, with a year under our belts there is less to do, in a way, because some things, like a wash station and cooler, are set up already; because of this, I think, the emotional distress I feel about the whole situation is considerably less intense! We also have better tools and more knowledge. 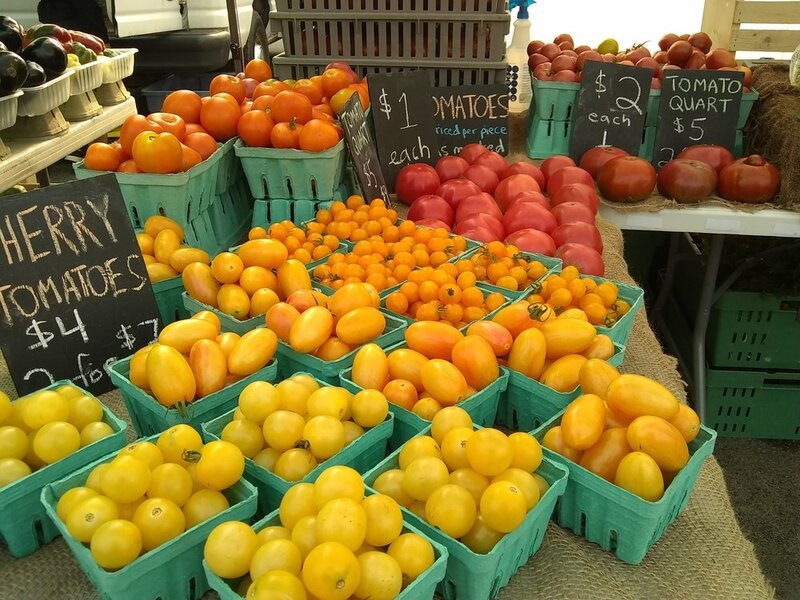 I'd like to focus in this post on something that surprised me throughout our first farmers market season (2018), which is the continual surprise on the part of many customers about our distance from the market. On a recent trip to Minneapolis meeting with various farmers marketers, several folks were similarly surprised. I initially felt a good deal of defensiveness, in part because my interaction with customers ended up focusing on what I felt was a negative attribute: being 'far away' might mean that lots of fossil fuels are burned to get our produce to the market; the distance also indicates a separation between the community we are serving in Minneapolis and our farm in Wisconsin. Getting past my negative perception of this situation, I am excited to share my thoughts surrounding these reactions, as I think they are rooted in misconceptions regarding the realities of food and small family farms. I am not hoping to rise to our particular defense, but rather to explore the topic of local/regional food and the options one has at a market like Midtown. Also, as a note, if any readers of this have shared this surprise with me, do not feel bad! It is understandable, and has motivated me to write this and to respond in a constructive way in the future! The Twin Cities market (this applies to most large urban areas) is attractive to farmers because of the people there and the health of the local food economy there. In our search for a farm, we intended to sell at market(s) in Minneapolis, ideally Midtown (yay! ), and we thus wanted to be close to that market. In 2017/2018, the Twin Cities real estate market was not an easy one for a farmer to enter, and that is even truer today. Realistically, if we had been lucky enough to have found a farm nearer Minneapolis that we could afford, it would have been very small (5 acres or less) and likely would have included a crumbling old house or no house at all. Additionally, it is likely that it would be very close to conventional corn and/or soy crops, which means chemical sprays could infiltrate our crops or our drinking/irrigation water. Instead, we drive our minivan a bit longer to get to market, with benefits: our neighbor is a certified organic grain grower; we still have a small parcel (9 acres) but it is enough to produce all of our firewood for heating and lots of straw mulch and leaves for compost and direct mulching of soil; there are barns that house our cooler, wash station, and residency/studio space (eventually! ); and, because it is affordable, we are not forced to abuse our amazing soil in order to make a larger profit. I sometimes classify our farm as very small, which I think is accurate: with almost no presence of engines of any kind in our field, we are gradually working up to 1 acre in cultivation and eventually more. Especially last year, our first, our market presence was relatively small, and some folks assumed we were located in the city or possibly the suburbs. If this were a valid assumption, then why don't we see mostly urban farms at farmers markets? On the surface, I agree that if food can come from the actual city, it does not make sense to be acquiring it from outside. Why is it unrealistic to expect urban farms to feed substantial numbers of city residents? Not all soil is healthy enough for farming! Food production should not be forced in these places. I am NOT suggesting that urban farming is unhealthy or inappropriate. Both urban and rural farming are key elements in sustaining the health of an urban community. My aim is to point out why one could and should expect to see small, sustainable growers at city markets, even if their farms are 50 to 100 miles away. I challenge the notion that driving 75 miles to sell fresh vegetables and fruit is at all excessive. It is not hard to imagine an individual who commutes to their office job that is 25 miles from home; plenty of people do this in the Twin Cities every weekday. With a comfortable 5 weeks off each year for vacation, this amounts to 11,750 miles just to move their body to the place where their office, computer, and coworkers are located. While not ideal, most people find this situation normal and acceptable. At Hexagon Projects & Farm, we pack the minivan full of produce and sell it 75 miles from our farm, which over 26 weeks amounts to only 3,900 miles driven. Is this not a more substantial and worthwhile activity than moving 1 human from house to office? 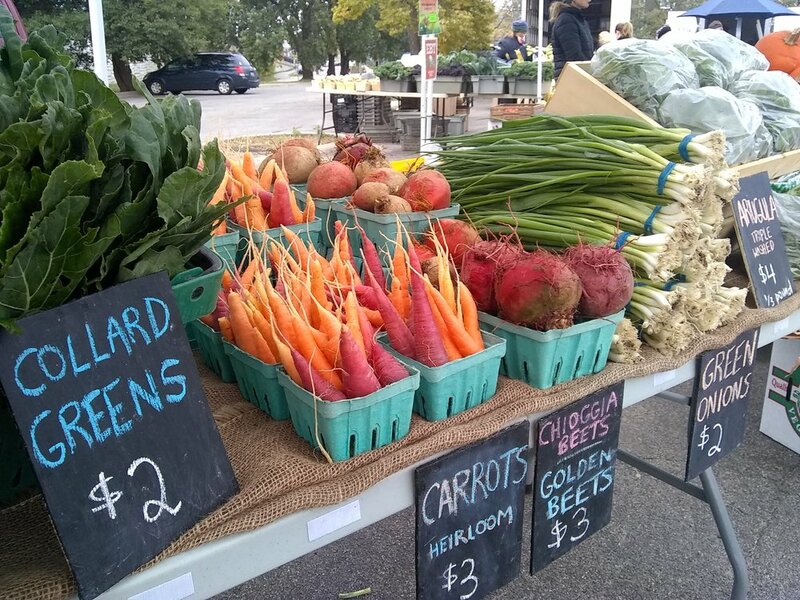 I encourage everyone to idealize small farms and farmers markets less, and to enjoy them more. We love selling at our farmers market, even if it means going to be very early every Friday and workin' it all day Saturday. The customers, music, vendors, and the environment are energizing, and the sales allow us to keep doing what we love to do, though admittedly not much more. I sincerely hope that folks read this and get a little something out of it, and if one has additional insights or problems with any of it, please get in touch! additional note: there is so much more to say on these topics, and indeed so much more potential when it comes to urban and suburban farming. If we as a society could get past our rigid view of land use and ownership, there is a serious amount of food production that could be done, sustainably, very close to areas with large population densities. If you enjoyed this post and are interested in following along with the growth of our farm, subscribe on the homepage to be notified whenever a new blog post is published! Find us on instagram and facebook for more updates and content we find interesting. no. 41: year 1 in review! Some of you already know that we are away from the farm for a 6-week break, a chance to spend time with family and friends all around the northeast, including a return to the farm in Poughkeepsie and a bit of time in Boston, Maine, Vermont, New Hampshire, and eventually Philadelphia. I had looked forward to sitting down early on and reviewing Hexagon’s first year, but with all of the moving about it has not happened until now, December 31, a perfectly appropriate date to look back on the year. We have occupied the farm/property since the end of November, 2017. 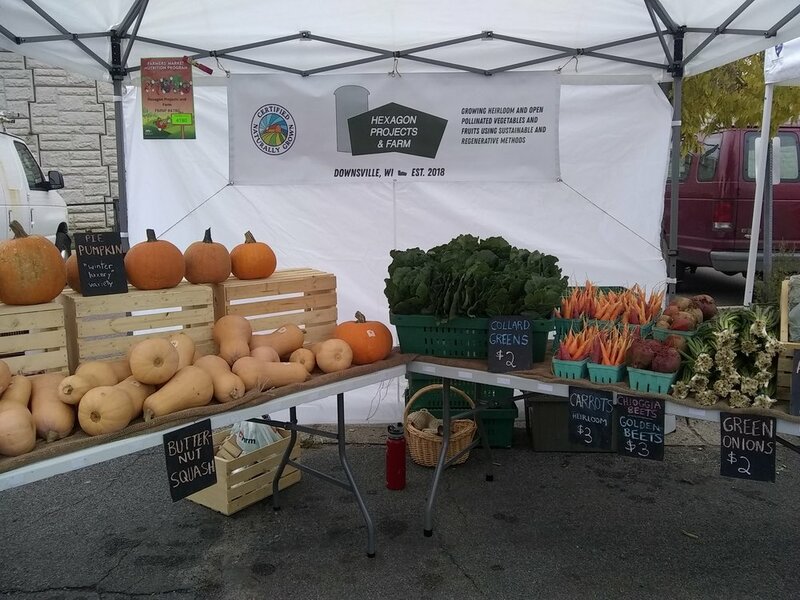 We finished our market season on October 27. Neither of us arrived with any market experience, but we enjoyed the experience and exceeded our goals re: sales and customer interactions. We will be at the Midtown Farmers Market again in 2019. 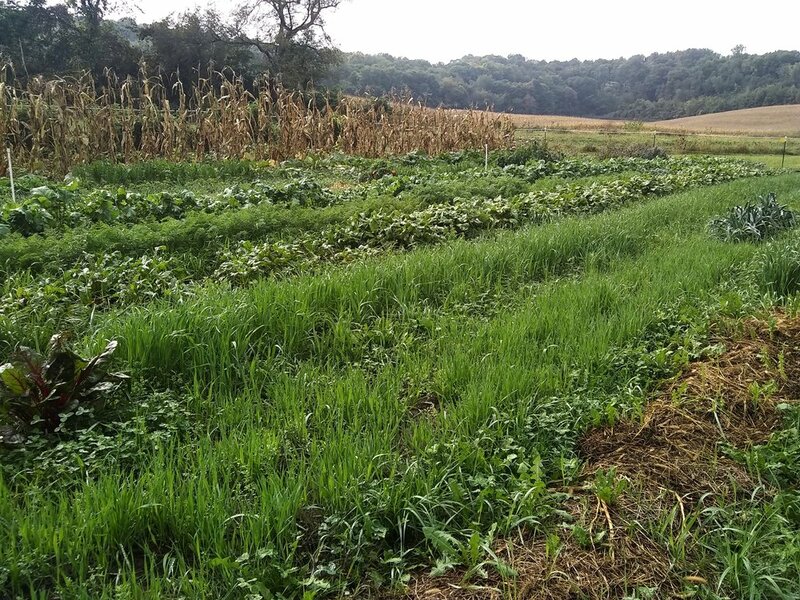 Work is currently underway in the creation of a cooperative CSA-type plan serving the Menomonie area and Twin Cities. We are excited to supply produce and work through the first CSA season in 2019! In terms of acreage we are still very small, but are expanding the growing area with very minimal powered equipment usage. We learned much in 2018 about market-scale companion planting and effective bed preparation. Oh! The farmers are also now married, as of July. Our intended creation of studio spaces and guest living space has not begun, but we hope to move forward with this in 2019. It was immensely helpful this first year to get a sense of the labor required to simply keep the fields and property in decent shape! This required much of our time, energy, and attention over the past 12 months. 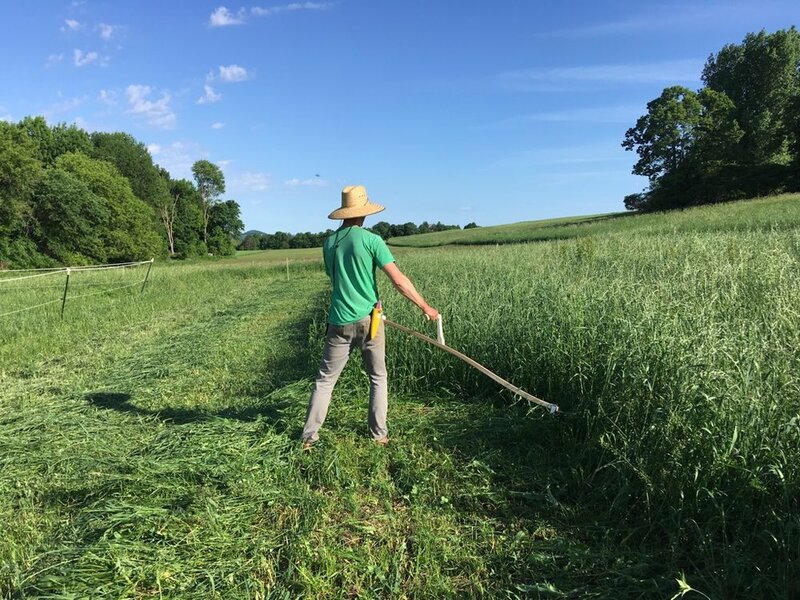 We continue to work toward resilience on the farm and throughout the farmstead, including heating with wood harvested on the farm, managing grass/producing hay and straw with a scythe, mulching everywhere, and establishing perennial food and energy crops. Spring snow and cold was quite the patience-tester: we seeded trays in the house, hauled seedlings to and from the house daily, and were on constant alert whenever snow was falling, given the weakness of our greenhouse structure. The alpaca/sheep/goose shed was converted to our wash/pack/storage space, involving much forking of manure and bedding and plenty of deep cleaning. We received much valuable help in this from Nick’s parents, including construction of an 8x8 cooler in the shed. We learned more and more about the farm over the course of the year, including the layout and condition of the well system and electrical supply. Knowing almost nothing about wells made this especially entertaining. Our growing system was slowly refined, and we felt good about our careful method of caring for important crops like tomatoes and cucumbers, which we were very proud of at market. That is all for this year. Happy New Year! Expect more updates once we return and get back to work in mid-January! Writing this week on the second-to-last day of October, the sights, smells, and sounds around the farm are signaling November (which happens to be my favorite month). Migratory birds have visited and sung from trees and shrubs; the field across the road is a bare spectrum of browns and yellows, the corn and soybeans having been harvested recently; and our garden is mostly cover crop and leaf and straw mulch, with some dry perennials and a few hardy veggies including parsnip, chicories, kale, and collards. Additionally, market season is over for us! We both attended the final market of the season, during which we almost sold out of cabbages, squash, and other good roasting/root crops and were visited by regular customers wishing a pleasant winter and checking in about next season. With weekly market on hold until May when the new season begins, the farm focus is fully on getting ready for winter, which mostly means some building and repair projects. Much on my mind, with memories of trudging through snow with a broom and a headlamp at 2:30 in the morning, has been our greenhouse, which is really an unsuitable structure to be relying on, made mostly of 1” PVC and in a location where lots of precipitation accumulates on it. Two days ago we finally gave up struggling with the structure I initially designed and took it apart, and will begin putting up a new wood structure today. This is an important upgrade, as we plan to grow earlier in the season in 2019 vs 2018, and more early-season transplanted crops, such as onions, will need space to grow. Additionally, we will be selling seedlings along with our produce during the month of May; all of this requires a warm greenhouse space we can rely on. We have also been ENJOYING this time. The transition to fall seems perfect for a little more contemplation compared to busy summer, and time to watch blue jays, marvel at the green of cover crop, or appreciate the changing sights and the ability to see our neighbors’ houses again. 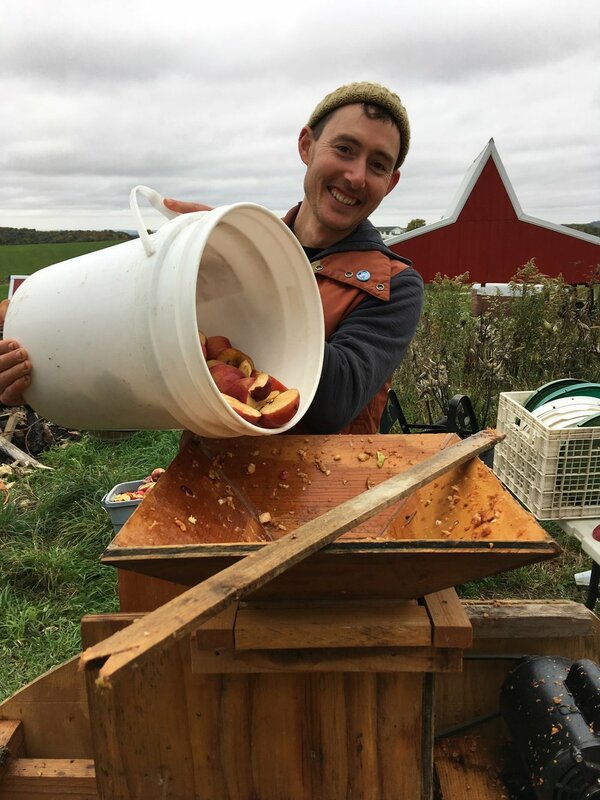 A couple of weeks ago we spent a glorious/somewhat brisk and misty day with friends nearby pressing apples for cider and eating delicious pot luck food. We also had the pleasure of amazing wood fired pizza and a lovely evening at our friends’ harvest party, celebrating their relatively new farm and community. AND I am of course baking all the pumpkin/chocolate/pecan/raspberry/cinnamon things about 12 hours out of each week, having an excellent time attempting to make the perfect scone(s). I decided to count the number of blog posts, and this is the 37th! More than I would have estimated, for sure. Some surprisingly significant changes have taken place around here over a short period of time, the big one of note being that I’ve started working part-time as baker at the coffee shop/restaurant in the center of Downsville. We’re still of course working hard on the farm, and have had plenty of variety and abundance at market. The Midtown Minneapolis Farmers Market has been a wonderful place for us to get started our first season. The foot traffic is generally high, and especially lately, we’ve connected with people (often customers) interested in discussing our farming methods, the variety we choose to grow, and/or our mission and plans for this project. I redesigned our tomato display for the most recent market, and every tomato I brought to market was sold that day. Naturally, since it’s the end of September, we are shifting toward winter squash, winter radishes, and other storage veggies. We expect a final tomato harvest on Friday 9/28, followed that evening by a predicted frost. We’ve begun offering delicious golden acorn squash at market, and the rest of our winter squash awaits in the slightly cool and dehumidified basement. And yes, these butternut squash have been washed. The reality of selling at market! As fall progresses, I am excited to get more baking done and settle into the new job. I have thought about a part-time job over the past several months, partially as a way to feel connected to town, and at 3 hilly miles away I am able to bike there until it becomes bitterly cold. The ability to live in the country and also bike (and walk, sometimes) to a job is fantastic. That’s it for #37. Have a good weekend and thanks for reading! A thing that I should by now expect, but that still surprises me, is that the distractions are so great come the first signs of fall (signs including: chillier evenings, field crops turning yellow, and winter squash and potatoes harvested). There is plenty to still care for farmwise, but I am crocheting, preserving, spending a little more time in our small woods, and just resting, rather than dutifully drafting blog posts. Honestly, it's pretty nice, and you'll just have to forgive me. Today is a good one for reflecting a writing, as it has rained consistently since the early morning and we're enjoying thinking about the gentle soaking the soil is receiving, and listening to it all. With some rain and mild weather, our plants are looking beautiful, and harvests and markets are going great. 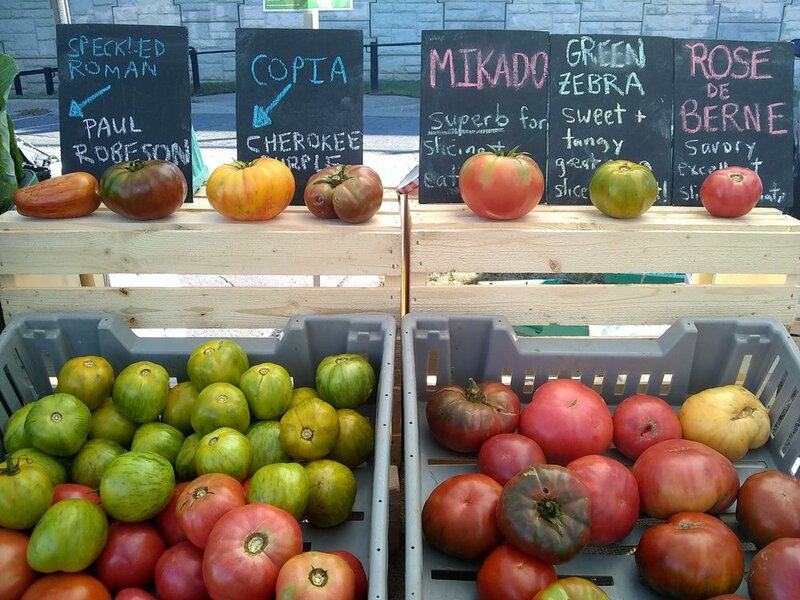 A few market highlights from last Saturday include beets, as always, and our collection of "2-bite" tomatoes: jaunne flamme, pink ping pong, and the small green zebra tomatoes. NO FILTER. In the last couple of weeks, we harvested all of our winter squash and our 4 varieties of potatoes. The harvests were reasonably abundant, especially considering that I didn't situate them all in ideal environments: especially the potatoes, which were smothered by nearby winter squash vines and neglected during the summer, yielded a bit less than otherwise expected. But harvest was FUN, of course, and we shall begin offering winter squash at market this Saturday, with beautiful and delicious golden acorn squash. I look forward to sharing in coming weeks our progress on various fall projects. After having arrived here in winter last year, we feel very fortunate simply to have autumn, and to be here, and to do the things! We want to build a caterpillar tunnel, continue mulching beds for next year, adjust the dimensions of the greenhouse so it makes more sense, prepare ground for more perennial plantings closer to the barns, install rainwater catchment system(s), gather/cut way more firewood. Yes. Thanks for reading the latest post, and welcome to September 2018!